Emilio Estevez wrote, directed and stars in The Public. 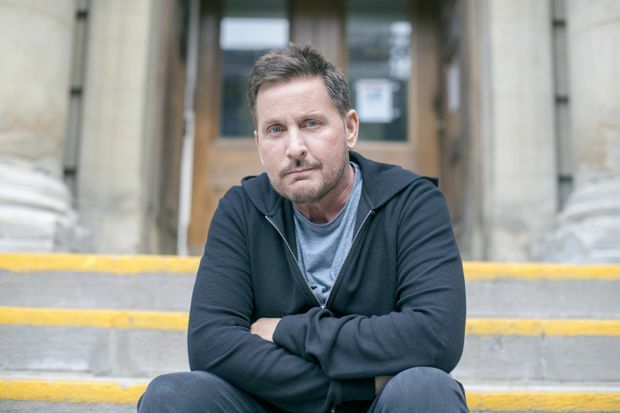 Emilio Estevez drove eight hours to the Toronto International Film Festival from his home in Cincinnati, Ohio. For a couple of reasons, this is not a sentence you expect to write about Emilio Estevez. He got in the wrong line at the border and was lectured by a customs officer when a light bulb started to go on. A lot of things about Estevez, 56, will surprise you – the fact that he has not appeared to age since the mid-eighties (“I am rotting on the inside,” he says gleefully) or that he prefers interviewing to being interviewed. Over the course of an hour, Estevez will ask me why I am a sportswriter (God’s plan), what it’s like being a sportswriter (great), which sportswriters I like (lots), if I get writer’s block (no) and how many words this article will contain (800). After each stumbling answer he'll say, “That’s so interesting” like he actually means it. If this is acting, I’m impressed. He is in Toronto debuting The Public – a crusading riff on Dog Day Afternoon set in a public library. He wrote, directed and stars in it, along with a blue-chip ensemble cast (Alec Baldwin, Taylor Schilling, Michael K. Williams et al.) The film took him 12 years of full-time effort from conception to realization. Though he doesn’t appear in much these days, Estevez’s celebrity is remarkably resilient, especially for those of us of a certain age. He was the approachable one in the Brat Pack, the guy with the famous father who still managed to carry himself like he hadn’t had it all gift-wrapped. “The same day I auditioned for The Breakfast Club, I auditioned for a Taco Bell commercial,” Estevez says with a shrug, like even he can’t believe it. On the morning he got turned down for Sixteen Candles – “And I killed it, man” – the casting director took pity and sent him to Venice to audition in an abandoned storefront for Repo Man in the afternoon. Though the heat has died down, he retains the twitchiness of someone used to being recognized and hoping to avoid it. What happens when you can’t? “That’s what the hoodie is for,” Estevez says. He has soured on Los Angeles and relocated to Cincinnati, where his new film is set and near where his father, actor Martin Sheen, grew up. The Sheens were an itinerant family through most of Estevez’s childhood, the entire bunch – parents and four kids – moving via station wagon to wherever there was acting work. “Like the Joads,” Estevez says, referencing The Grapes of Wrath and not feeling the need to point it out. The city he recalls most fondly is New York in the seventies. Contemporary Cincinnati reminds him of that. Plus, it’s cheap. He doesn’t like flying, so he drives as much as possible. He does like libraries, reading and doing research – the ditch-digging of the film business. He also likes playing librarians as well as garbage men and other sorts of working-class scavengers. “I’m interested in ordinariness,” Estevez says, in the breathy way that you or I would say, "I am interested in space travel." For instance, a few years ago Estevez’s fiancée started a wine business in their garage. That grew into a beer business, which in turn grew into a bit of a pub. Estevez served drinks. A customer pointed out to him – not entirely kindly – that this was the opposite of the way Hollywood functions. You’re supposed to work a bar before you get famous. “They had their fun with me, but there was something really wonderful about being in the hospitality business and serving people,” Estevez says. I have worked in the hospitality business. I did not find it wonderful. In fairness, I didn’t grow up on the set of Apocalypse Now or have a big part in Badlands when I was in grade school. So, different strokes for different folks. After chatting, a bunch of us walk over from the Four Seasons Hotel to near the Toronto Reference Library, where Estevez will be screening The Public at a Tuesday evening Q&A. Audience members should come prepared to answer a lot of questions. He pretends not to notice. And then, though no one has said anything, he steels himself and turns once more and says, “Okay, fine, I’ll read it,” and sighs.